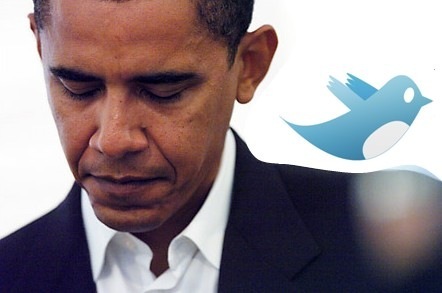 why I’m unfollowing @barackObama: a social contract broken. It’s in sad contrast to this hope I felt watching astonished through the morning of President Obama’s swearing in ceremony, that I now am going to unfollow @barackObama. I honestly have to admit that it’s a little bit of what I expected when I followed @barackObama. I expected that, because that’s what Twitter is for. To be sure, this is a great message, but ultimately not why I’m into Twitter. Perhaps you noticed how I phrased the intro, “today I got this tweet from Obama”, as if this had been whispered to me in passing down a long hallway. OFA is a special project of the Democratic National Committee. There’s frequent references to “I” and “we”, which implies that it’s actually Obama doing the tweeting but instead of an inside view into the life of the president, I get a recounting of news which someone else is implying that Barack himself would be interested in. There’s also a problem here where someone is speaking with the voice of a public figure, and in a sense, impersonating them. To quote more intelligent folks than myself, “ur doin it wrong”. « is innovation nature or nurture? is the iPhone the spiritual successor to the Palm line? is innovation nature or nurture?